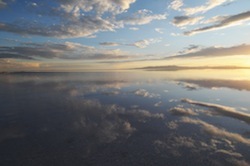 Ojaván bath salts originate when the healing waters of the Great Salt Lake, America’s Dead Sea evaporate and form billions of salt crystals. Over 250 million years old this salt has been named white gold as it has accumulated an eternity of sunlight and natural energy. Each crystal contains over 70 trace minerals and elements essential to healthy skin and moisture balance. Ojaván bath salts are pure and unprocessed. For centuries salts have been used to remove toxins from the body. By adding Ojaván bath salts to your bath you revitalize the body and mind by hydrating and detoxifying, soothing skin conditions and strengthening the immune system. Soyala’s peppermint aroma is fresh and invigorating. It has a peaceful effect and it’s rejuvenating properties can help rid mental fatigue, stress, and anxiety. Peppermint can provide relief from the common cold, congestion, and to reduce pain. Celestite brings mental calm and clarity in the midst of chaotic times. Celestite can allow you to flow through a traumatic period and still come out on top. This entry was posted in Ojavan Products and tagged Bath, Bath Salt, Bath Salts, Beauty, Beauty Products, Body, Crystals, Essential Oils, Great Salt Lake, Green, Green Products, Natural, Natural Beauty, Ogden UT, Ojavan, Ojavan Products, Orgainic Products, Organic, Salt, Salt Lake, Skin, Skin Care, Utah. Bookmark the permalink.